Dana Randall, Ph.D. is the ADVANCE professor in the College of Computing, director of the Algorithms and Randomness Center, and an adjunct professor of mathematics at Georgia Tech. She received her Ph.D. in computer science from the University of California at Berkeley and her undergraduate degree in mathematics from Harvard, subsequently holding postdoctoral positions at the Institute for Advanced Study and the Center for Discrete Mathematics and Theoretical Computer Science (DIMACS) in Princeton. 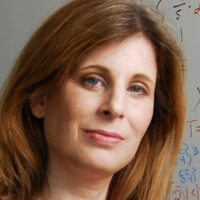 Randall’s research on randomized algorithms focuses on designing efficient sampling algorithms and her work has helped create an interdisciplinary field bridging computer science, discrete probability, and statistical physics. She currently co-leads the Georgia Tech Strategic Initiative in Data Science. Randall is a fellow of the American Mathematical Society (AMS) and a national associate of The National Academies. She received a National Science Foundation (NSF) CAREER Award, Sloan Foundation Fellowship, is a four-time Kavli Fellow, and has won numerous teaching, research, and service awards at Georgia Tech. Randall gave the AMS Arnold Ross Lecture to high school students and their teachers in Augusta, Ga. in 2009, an AMS Invited Address at the Joint Mathematics Meetings in Baltimore in 2003, and has given keynote addresses at conferences in Peru, Norway, Czech Republic, and United States. She currently serves on the International Scientific Advisory Board of the Centre Recherches de Mathematiques in Montreal, External Advisory Board of the NSF Center for the Science of Information at Purdue University, steering committee for the Symposium on Discrete Algorithms, Committee for the Advancement of Theoretical Computer Science (CATCS), and editorial board of Theoretical Computer Science. Randall chaired the program committee of the SIAM/ACM Symposium on Discrete Mathematics in 2011 and co-chaired the organizing committee of the SIAM Conference on Discrete Mathematics in 2016. Previously, she has served on the Board of Governors of the Institute for Mathematics and its Applications (IMA) in Minnesota, steering committee of the Center for DIMACS at Rutgers, AMS Editorial Boards Committee, AMS Program Committee for National Meetings, and the editorial boards of the Annals of Discrete Probability and SIAM Journal on Discrete Mathematics (SIDMA). Randall chaired the program committee of the SIAM/ACM Symposium on Discrete Mathematics in 2011 and co-chaired the Organizing Committee for the SIAM Conference on Discrete Mathematics in 2016. Co-organized the workshop, "Connections for Women: Discrete Lattice Models in Mathematics, Physics and Computing," at the Mathematical Sciences Research Institute (MSRI), Berkeley, January 2012. Delivered the lecture at the 2006 Wetterhahn Science Research Symposium, Dartmouth College, Hanover, NH, May 2006. Delivered the 2009 AMS Arnold Ross Lecture, Augusta National Science Center, Augusta, Ga., October 2009. Delivered the Carl J. Rees Distinguished Lectures in the Mathematics Department of the University of Delaware, November 2012. Delivered the D.W. Weeks Mathematics Seminar at MIT, March 2013. Served on a Joint Committee on Women in the Mathematical Sciences panel discussion on effective self-promotion to advance your career in mathematics at the Joint Mathematics Meetings, 2014. Served as a reviewer for the “Canada Excellence Research Chairs Program” to evaluate the quality of the institutional recruitment process, including attention to diversity. Served on the organizing committee of an upcoming 2016 WIE/IEEE Women’s Leadership Summit in Atlanta.